ViewSonic might not have the wide reach of Apple and its iPad, but it managed to turn some eyes at Computex after announcing the world’s first seven-inch Honeycomb tablet, the ViewSonic ViewPad 7x. But the company, known mostly for its computer displays, didn’t stop on that and introduced the ViewSonic ViewPad 10Pro, a 10 incher running Windows 7 Pro. 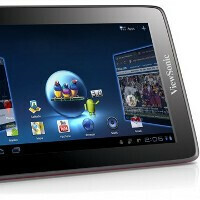 The ViewPad 7x, on one hand, comes with a dual-core NVIDIA Tegra 2 processor, which powers Android 3.0.1 Honeycomb displayed on the 7-inch screen with a resolution of 1024 x 600 pixels. Throw in “the fastest-ever” HSPA+ radios, HDMI support and DLNA, and you have a nearly full connectivity package. Folks willing to experiment taking pictures with a tablet will be happy to see that the ViewPad 7x comes with both read and front-facing cameras. Looking at the almost standard dual-core processor and features, we’d find it hard to pinpoint a single distinctive feature on the background of the rest of the uniform Honeycomb tablet crew, but it’s the screen size and light weight of only 13.4 ounces (380 grams) that make the seven incher from ViewSonic somewhat different. The ViewSonic ViewPad 10Pro, on the other hand, follows closely the footsteps of the ViewPad 10, which we reviewed earlier. The ViewPad 10Pro will appeal to corporate folk with its pre-installed Windows 7 Pro OS. And productivity should be optimal with the 1.5GHz Intel Oak Trail Z670 processor under the hood. The 10 incher can also run Android 2.2 Froyo on a virtual machine, but it’s not a fully-baked dual-boot device, so don’t get your hopes too high. The tablet does however support USB, so you can further expand your storage via USB-compatible devices or microSD cards of up to 32 gigs. The 3500 mAh battery promises 4.5 hours of full HD 1080p video playback. Pricing and release dates remain unknown, but we’ll surely hear more about the tablets soon, but in the meantime feel free to share your first impressions about ViewSonic’s announcements in the comments below!